Locate and track your lost iOS device using a family members’ device on a map. Play a sound on your iPhone to help you find it. Protect your iPhone with Activation Lock. 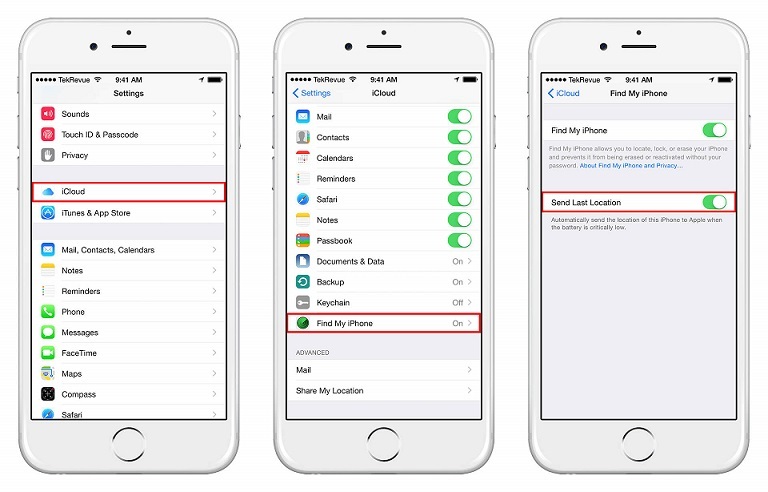 Activate Lost Mode to lock and track your iPhone. Remotely wipe your personal information from your iPhone. To enable Find My iPhone on your lost device, click Settings > Apple ID > iCloud > Find My iPhone > Switch buttons to enable it. Step 1: Get an iPhone, iPad or iPod touch from a family member or friend. Launch Find My iPhone app. Step 2: Login with your Apple ID. Step 3: Click the name of the device you would like to find, and click Actions. Three options will be displayed: Play Sound, Lost Mode and Erase. Choose lost mode. To learn more about lost Mode, read more about the steps in Part 4 of this article. Lost Mode is a Find My iPhone option that locks your iPhone, iPad, iPod touch, Mac, or other iOS devices so that other people will not be able to access your sensitive and personal information. 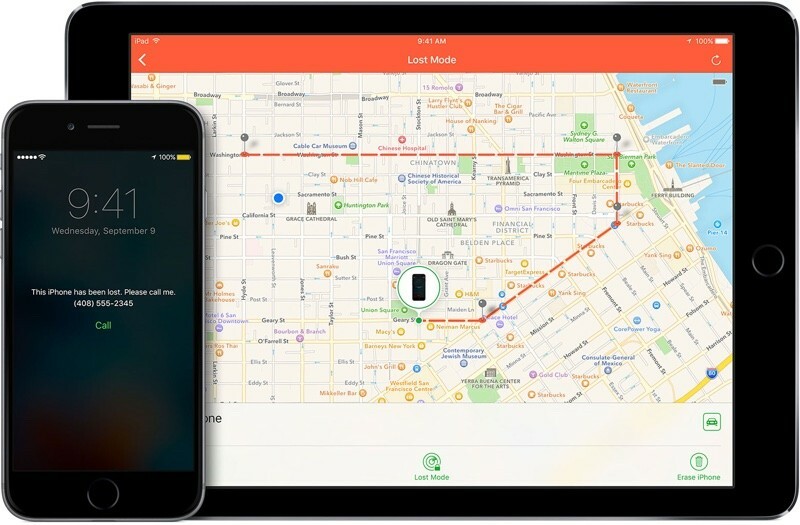 It can track changes in lost iPhone location, and keep track of lost iPhone location. Step 1: From step 3 in “How to use Find My iPhone to find a lost iPhone” click to turn on Lost Mode or Lock. Then follow the onscreen instructions. Step 2: You’ll be asked to add your phone number, enter your number where you can be reached. You may also be asked to type a message, please type a message that would state that your device is lost, and how to contact you. Step 3: Once you switch to Lost Mode, your iPhone will be locked and tracking will begin if your iPhone is online (you’ll see a green circle on the map pointing to the iPhone’s current location). If your iPhone is offline (you’ll see a green circle on the map pointing to the iPhone’s last known location), and tracking will begin when next your iPhone comes online. When your iOS device goes missing, you can easily locate it with finding my iPhone if the phone is turned on. However, a switched-off device or a lost device with a dead battery will pose a problem to be recovered. Does Find My iPhone work when phone is off? No, but it can show your iPhone’s last known location if you’ve previously enabled “Send Last Location” on your lost iPhone. If so, once you click “Lost Mode” on Find My iPhone, you’ll find a grey circle pointing to the last known location of your iPhone. You can click on the grey icon to see more information about the location and time. 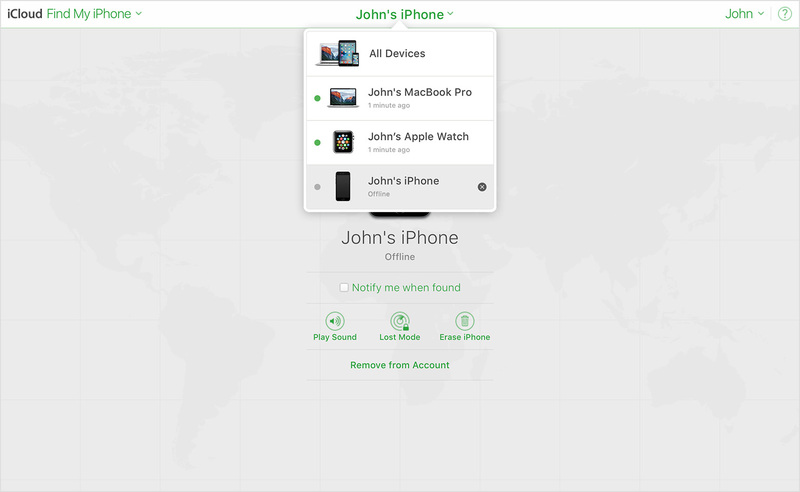 We’ve tried in many ways to answer the question “Does Find My iPhone work when phone is off?” We’ve given many solutions on how to track or find a lost iPhone, but one thing is yet to be said; Find My iPhone does not work when iPhone is off. 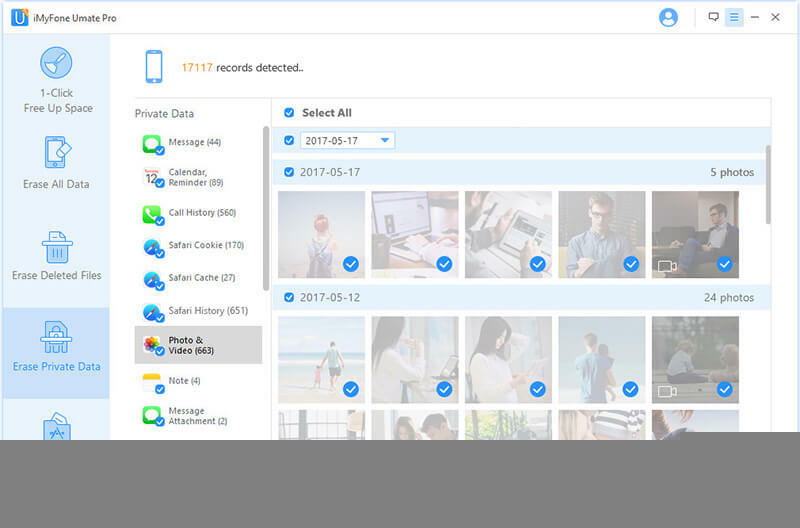 The question that arises now is “How can I protect my privacy?” the most effective solution to protecting your sensitive information on an iPhone is through iMyFone Umate Pro. iMyFone Umate Pro for Win or for Mac is the ultimate privacy protection tool for all iOS devices. It can permanently erase all your private data such as private photos, browsing history, emails, credit card details, or other private information from your iPhone, iPod touch, or iPad, and render such data 100% unrecoverable. Secure private data against unforeseen circumstances like loss or theft of iDevice. Erases every kind of iOS files, and can scan previously deleted files to wipe them out completely. 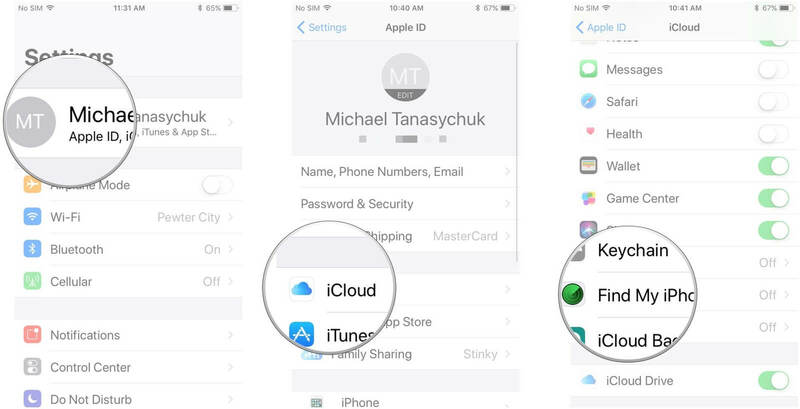 Erase all forms of iOS private and personal data on your iPhone to avoid data compromise should iPhone get missing. Preview scanned files, and select all or some for deleting. This helps to avoid erroneous erasure of important files. Ensure that app fragment, temporary files, and junk files are totally wiped out. Step 1: Download and install iMyFone Umate Pro on your PC/Mac, and connect your iPhone using a USB cable. 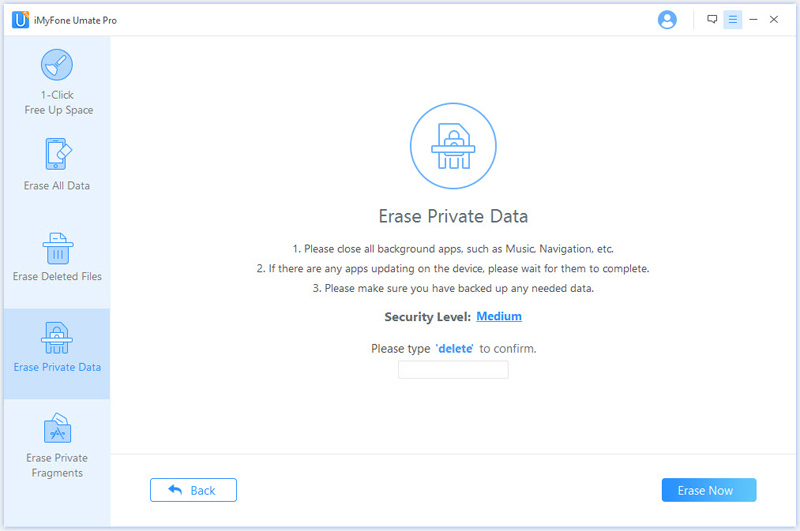 Step 2: Click “Erase Private Data” tab from the Erase Mode menu at your left hand. Then click “Scan” tab, and Umate Pro will scan your iPhone for private files and data which may include messages, call history, safari contacts, etc. Step 3: Preview through the records detected and select the files to totally wipe out. Click “Erase Now” tab and choose a security level. Then confirm by clicking "Erase Now” button again. At this point, all the private data and files you selected for erasure will be permanently wiped out.